The 'Lledo' company was started in 1982 by Jack Odell, who was the ex-president of Matchbox. Together with a Mr Bert Russell they founded Lledo as a diecast model company. The name 'Lledo' came from Jack Odell's war days when he was based in the African desert. In order that he wouldn't forget his wireless call sign, he reversed his surname and hence became known as 'Lledo'. 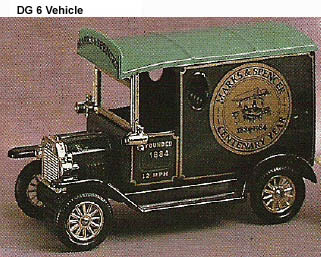 Their aim was to recreate the 1920's and 1930's area in diecast vehicles and wagons. The range was to be named 'Days Gone'. To be able to do that they bought some of the surplus machinery from Matchbox. It was the end of Lesney Products (Matchbox Toys Ltd.), which had gone bankrupt on June 11, 1982. Universal Toys, owned by David Yeh, bought them on September 24 of the same year and moved the factory to Hong Kong, but some of the machines went to Lledo. Lledo set about an eight month tooling-up programme to be able to produce six new models. 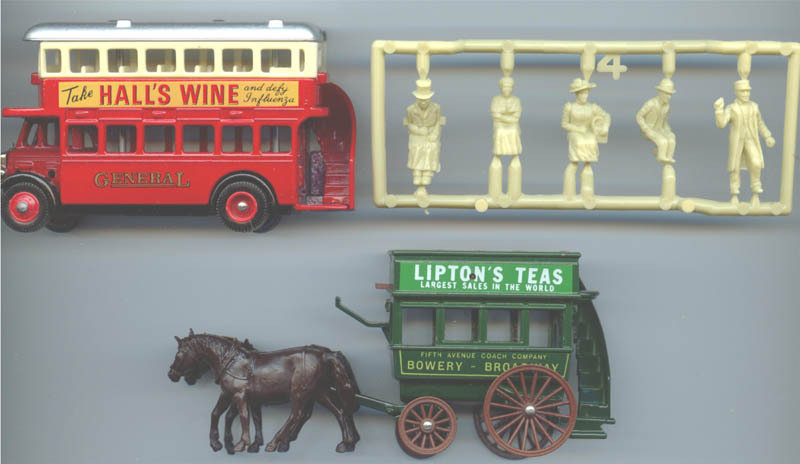 These first models were mainly re-makes of some of the most popular and respected first and second-generation Matchbox 'Models of Yesteryear'. The first items were produced and shipped in April 1983 and a promotional campaign started. The Days Gone range was promoted as British made, quality vehicles. They had an interesting concept in the early days by producing only a few types of vehicles, but each time with different decals, logos and brand names. Most of these limited editions were produced in runs of 500 to 1000 models only. Those early sets were later sold with figures as well. By the end of 1984, and after considerable investment in new tooling, Lledo was able to launch a further seven 'Days Gone' models into the range and now the range was substantial and the toy trade started to take a real interest. Year by year further models were introduced and the collectors following grew and grew, whilst at the same time more and more companies saw the potential for commissioning their own promotional models. In later years many more vehicles were produced, but all without figures and therefore not of real interest for this article. 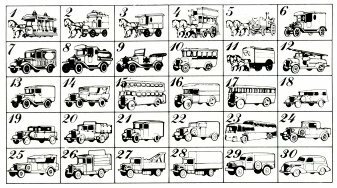 Nevertheless the range became increasingly popular and many private companies ordered vehicles to be made with their own logos. As a result, probably hundreds of different models were made, and so there are many collectors. 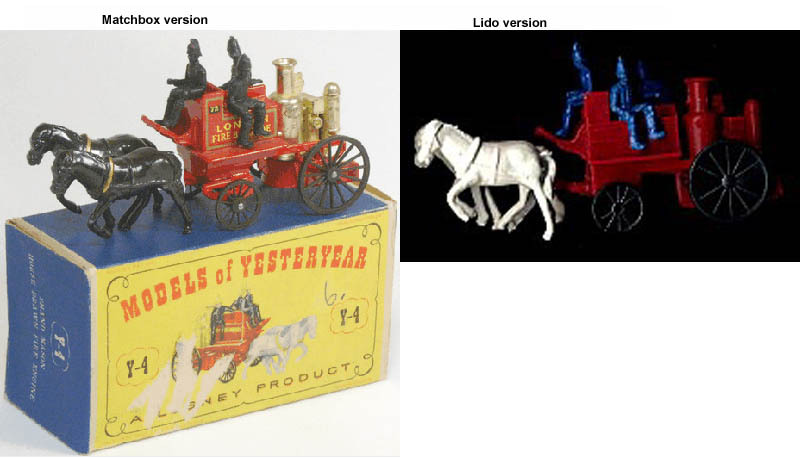 In the year 1998 Lledo was the largest die-cast model making company still manufacturing in Great Britain employing around 300 people, and producing over 6 million models per year. In the following year the Lledo factory in Enfield, England, ceased production, the company was bought by Corgi and production was moved to China, where it remains to this day. 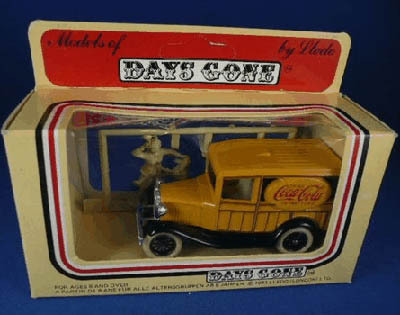 Most sets were packaged in boxes mounted on cards and with a front window. The numbering of Lledo sets requires some explanation. 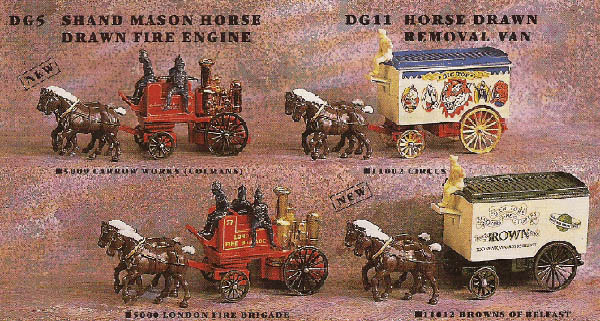 Model nr 5 (the Horse Drawn Fire Wagon) was simply called DG5 (Days Gone 5). But as soon as special decals or logos where glued on the wagon it became for example DG5009, being the 9th type of decals of model nr 5. See pictures below for some examples. So, don't get confused when searching these vehicles on the internet. And what about the figures? Figures came with 14 Days Gone models, and in total 39 unique figures were produced. It seems to me that many vehicles were first released with drivers only, and only later with more figures on a sprue. When this was the case it is discussed in the text below. In the table below I use for example DG2 and DG2b to separate the same set with driver only, and with driver plus extra figures. These 'b' numbers are not official Days Gone codes, just my own method of distinguishing them. 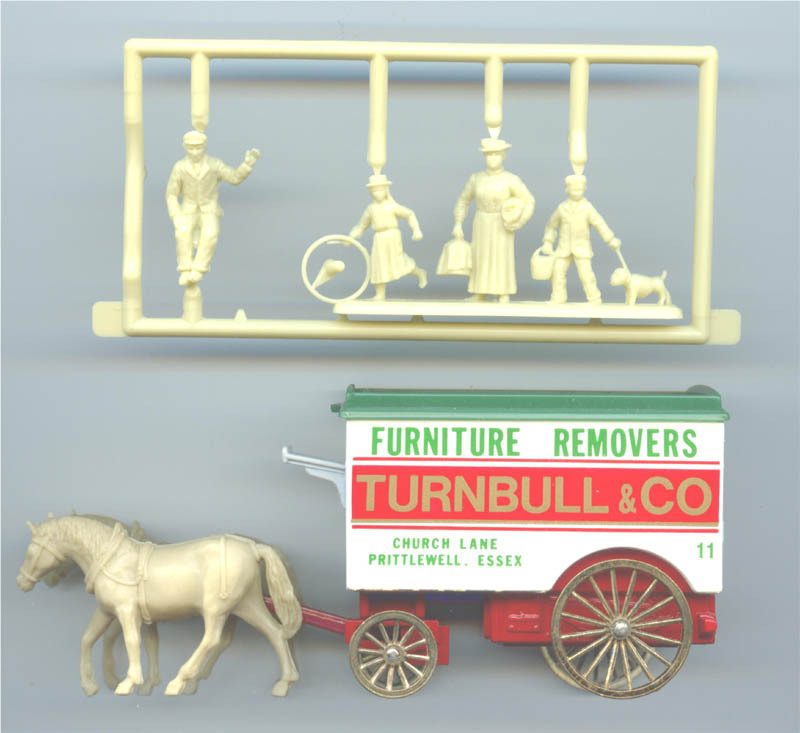 The horse drawn tram was released with 5 yellow figures as can be seen in the picture. 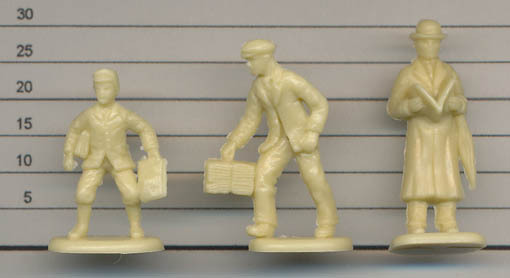 The figures look like the figures included in DG 4 and 15, and some are the same sculpt but a slightly different size, while some are different. The horse is also made out of plastic. This model was produced with one single driver (on the right in the picture), and later with 2 more figures. This model was produced with one single driver (on the left in the picture), and later with 2 more figures. The horse is also made out of plastic. 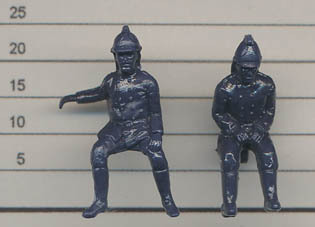 DG 4 and 15 came with the same figures as can be seen in the picture above. 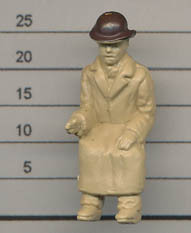 DG 4 was also sold with the driver only (the left figure on the sprue). The horse is also made out of plastic. DG 5 is a special one. It came with 3 fire fighters as can be seen in the picture. This model was one of the Matchbox re-casts. And the matchbox version also contains figures. But these are mirror types of the Days Gone versions (and a bit smaller). The days gone figures have their right arms stretch out, while the Matchbox ones have their left arms out! 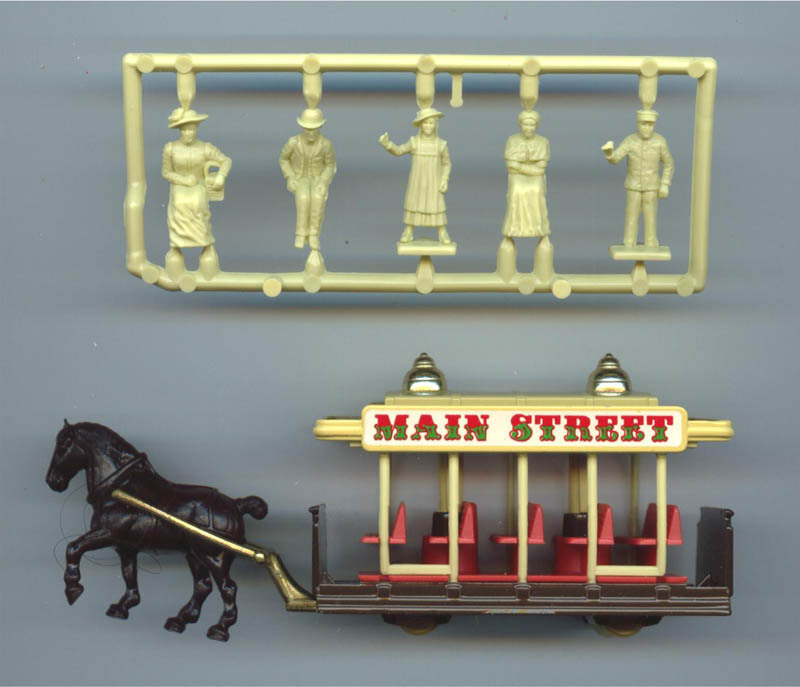 These wagons where later also copied by Lido (with the same Matchbox figures) and Giant (but with different type of figures). The horses are also made out of plastic. DG 6 and 8 came with the same figures as can be seen above. 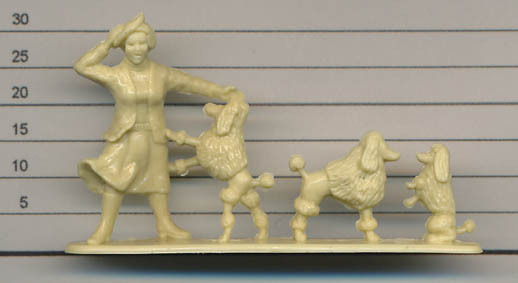 DG 7 came with a very interesting pose; a lady with 3 small dogs. Never seen such a thing before (or after) in the 1:72 world! 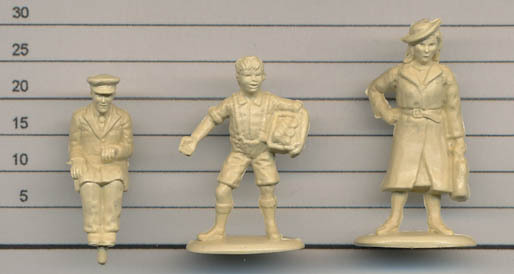 DG 9 came with cops and robbers figures. The sitting police officer goes into the car, the other ones are the bad guys surely running away with bags full of money I presume? DG 10 also came with a bunch of interesting figures, all on one base. The idea is that they are waiting for the bus. This model was produced with one single driver (on the left in the picture), and later with 3 more figures. Again very nice figures! The horses are also made out of plastic. 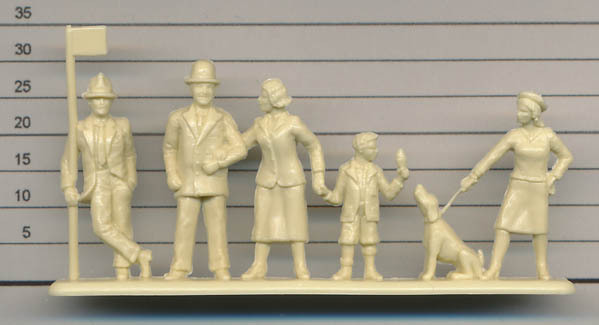 This model came with the 3 figures above. DG 31 is the last model that came with a figure; a driver only. His hat is pre-painted; the only one in the whole range. If you have any questions and remarks feel free to contact me. Victor Rudiks' One Inch Army. Lledo models collector sites. With some of their old catalogues for download. A must!